A short half day predator fishing trip to IT Monster Predator Lake in Thailand saw Brendan and Rick latch into a succession of hungry predatory fish. They were accompanied by Boy. 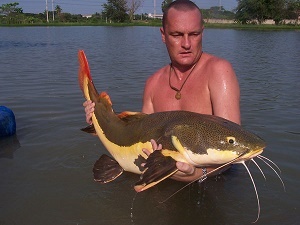 The anglers fished a short five hour session using live baiting tactics, bagging numerous species including Redtail catfish, spotted Sorubim, Chaophraya catfish, Giant Snakehead and various other species with weights up to just over the 30kg region. By the end of the short five hour fishing session the anglers had accounted for no less than eighteen individual captures from this highly prolific Thailand predator fishery.